Week 6 of the college football season is upon us. And after five weekends of games, we're in store for another exciting Saturday, both on the field and on the daily fantasy slate. Here, our goal is to help you field a roster full of fantasy goodness, and in true numberFire fashion, we'll use our in-house projections as well as betting totals and advanced statistics to tackle both early and main slates all the way up to the College Football Playoff. This week's main slate consists of 13 games, including the Red River Showdown between the 7th-ranked Oklahoma Sooners and 19th-ranked Texas Longhorns. Will Grier, West Virginia ($10,500): This one is simple. Grier ranks third in the country in both yards per attempt (10.9) and quarterback rating (200.7). He's at home in a Big 12 matchup against the Kansas Jayhawks (120th in Football Outsiders' defensive S&P+), and the West Virginia Mountaineers boast an impressive 44.75-point implied team total. Don't overthink it; get exposure to Grier in your CFB DFS lineups this weekend. Kyler Murray, Oklahoma ($10,400): Kyler Murray may want to reconsider going into baseball, because man can the kid play. Murray leads the FBS with a 13.4 yards per attempt mark. He also ranks second with a 230.9 quarterback rating. Oh, and he's also added 285 rushing yards and 4 rushing scores this year. With a tough game against the rival Longhorns on tap, this is a chance to get a talented player at minimal ownership as DFS players look to quarterbacks in easier matchups. You can also rock with Clemson starter Trevor Lawrence, ($8,500) if you're looking for a cheaper option. He is probable after leaving last's week's game early due to injury, and Wake Forest ranks just 84th in defensive S&P+ this year. Lawrence boasts a 9.1 yards per attempt and 174.2 quarterback rating, and should have a field day in this plum matchup. Tua Tagovailoa, Alabama ($10,200): The perception is that road SEC games are always tough, and while there is some merit to that, you can leverage that bias by playing a supremely talented player with the second-highest implied team total (45.75) on the slate. Even as he travels to Arkansas, Tagovailoa ranks first in the country in quarterback rating (238.5) and second in yards per attempt (13.2). Heck -- he even ranks second with a 75.0% completion percentage. 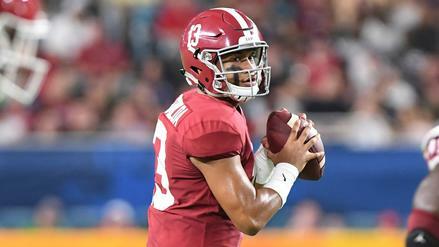 Right now, Tua's efficiency is off the charts, and he is the well-deserving favorite to win the Heisman as a result. 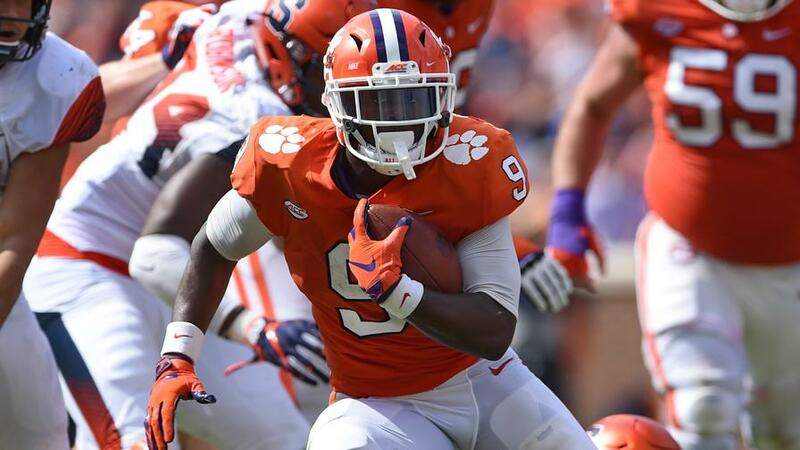 Travis Etienne, Clemson ($9,900): Etienne ranks seventh in the country with 594 rushing yards this year. He is also tied for fourth with eight rushing scores. 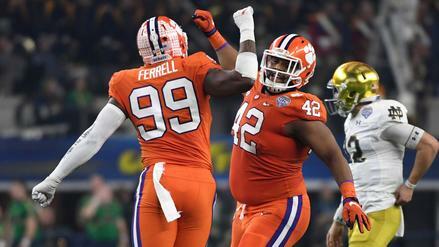 The Tigers are massive 20-point favorites, and as mentioned before, Wake Forest ranks just 84th so far in 2018. For a slightly cheaper option, you can look toward Texas A&M Trayveon Williams, ($9,000). Williams, through five weeks of the season, ranks eighth with 582 rushing yards on the year, and he gets the opportunity to play at home against a Kentucky Wildcats team with just a 14.5% stuff rate, which ranks 114th on the season. Adrian Killins Jr., UCF ($9,600): This one's pretty simple. Led by McKenzie Milton, the Central Florida Knights are one of the most explosive offenses in the country (ninth in offensive S&P+). As a result, they are 24.0-point home favorites over the Southern Methodist Mustangs. Killins is the workhorse for this UCF team, and as the primary back tied to a good offense in what projects to be a good game script against a team that ranks just 92nd in defensive S&P+ this season, Killins is a terrific play. For a cheaper option, you can use Damien Harris ($7,700). Harris has just 13 fewer carries this season than Alabama teammate Najee Harris (49 to 36), but he leads the team's running back trio with 6.9 yards per carry. He also leads the running backs with 8 receptions for 99 yards. With Alabama playing as massive five-touchdown favorites, Harris should feast. 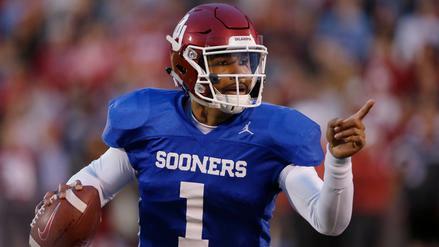 Marquise Brown, Oklahoma ($10,000): A Kyler Murray/Marquise Brown stack could prove to be highly profitable in DFS this week, as it has in the past. But as previously mentioned with Murray, that stack could go low-owned because of the cost and matchup against a tough Longhorns defense. That can make it contrarian, however, and Brown is top-20 with a 28.97% target share. Thanks to Murray's efficiency and Brown's talent, that target share has translated to 544 receiving yards (which ranks 8th-best) and 5 touchdowns. South Carolina's Deebo Samuel, ($8,800) ranks top-25 in the country with a 28.21% target share, and he gets to square off against the 80th-ranked Missouri Tigers defense, so he's certainly a cheaper option to consider atop your wide receiving corps. Greg Dortch, Wake Forest ($9,400): Dortch is top-10 in the nation with a 31.28% target share. He's also got a 8.38% red zone target share, which is top-20 in the nation. As a result, Dortch ranks sixth with 555 receiving yards. In a matchup against Clemson, in which Wake Forest is 20-point home underdogs, the Demon Deacons should be chucking the football all day, and if past usage is any indication, those balls will be funneled in Dortch's direction. Mizzou wideout Albert Okwuegbunam ($7,500) has a name that is a handful to pronounce, but at a 15.53% target share he leads the Tigers, yet is priced like he's a second option, at best. 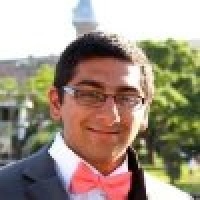 James Proche, SMU ($9,200): Proche ranks third in the country with a 37.23% target share this year. He also ranks top-5 with a 10.22% red zone target share. And the Mustangs are still expected to rack up some points (25.25) despite their roll as big underdogs. However, f you're' looking for a discounted wide receiver who can open up salary elsewhere, look no further than Notre Dame's Chase Claypool ($7,400). Claypool's most attractive feature is his volume, as he's received 18.85% of the Fighting Irish's targets. As the target leader for a 4-0 team, Claypool is worth a dart throw at such a cheap price, especially with the switch to Ian Book reigniting the passing offense in South Bend.